With the development in the field of technology, day by day new appliances are being devised for use in the kitchen. The appliances developed have made cooking easier and quicker. One of these modern appliances is a microwave rice cooker. Microwave rice cooker is a popular and modern cooking appliance which makes cooking more convenient and easy. Various kinds of Chefs all over the world prefer using microwave rice cooker for its unique features and facilities. The rice cooked in a microwave rice cooker is fluffy and tasty. There is no chance of overcooked or undercooked rice if you own a microwave rice cooker. You just need to keep the cooker filled with rice and water for a prescribed time limit inside the microwave oven. The design of the microwave rice cooker is similar to the traditional cooker. It has a tall, tight fitting lid and an inner ventilation vent. If you have been using a microwave oven to cook rice, microwave rice cooker can easily come within your budget, and it makes your work easier. A Professional Cook always prefers using a microwave rice cooker since it is convenient to use. While the starters will also not find using a microwave cooker difficult. The steps to use this cooker are simple. An excellent cook and an efficient one are two different personalities. Whether you are a homemaker or a bachelor staying away from family, you always need to cook rice. In case some unexpected guests arrive at your home suddenly, cooking rice for them will be the best option. Cooking the best rice recipes is always welcomed since it not only satiates your hunger but is also easy to cook. Make sure that you do not use any steel vessel inside the cooker since the cooker is supposed to be used inside the microwave. Steel vessels may cause serious accidents. First of all, watch the kitchen cookware properly while using it for the first time. Warm water and a gentle soap can be used to wash the cookware. Avoid using metal scrubbers since they lead to permanent scratches on the surface of your rice cooker. After washing the rice cooker, dry it properly. A soft kitchen napkin can be used to dry all the water from the cooker. After washing the cooker thoroughly, we come to the main procedure about how to cook rice. Wash the rice under running water properly. To check whether rice has been properly washed add some water to the bowl of rice, if the rice is clearly visible to you then it has been washed properly. After washing the rice grains, transfer them into a rice cooker container. Some cooking oil and a pinch of salt can be added to the rice as per your choice. Plain simple water or chicken stock can be used as per your choice to the rice. The water proportions also need to be taken care of while cooking rice. After putting everything inside the cooker, close the inner lid. Then attach the main lid properly. Ensure that the latch of the cooker has been perfectly closed. A click sound while closing the latch is the sign of the cooker being perfectly closed. Keep the cooker on your kitchen counter after closing the lid. Now, switch on your microwave oven and heat it for around 10 minutes. After heating the microwave for 10 minutes, keep the cooker within the microwave oven. Wait for the prescribed number of minutes. The time required to get your rice cooked depends upon the quantity and quality of rice being used. Check whether the rice is cooked or not after a few minutes. For checking, first of all bring out the cooker from the microwave. Place it on your kitchen counter properly. Let off the initial steam generated by the cooked rice. After the steam is let off, the texture of the rice can be felt. If the rice has not been cooked completely, again put the cooker back inside the microwave in the same way as before. While checking the texture of rice, few spices can also be added to give a unique flavor to the rice. While you do this checking, you can also stir in some spices to add flavor to the rice. After the rice gets cooked, take them out with the help of a spoon from the cooker. Hence your rice is ready to eat. In case you want to have the rice later, place the cooker with the cooked rice inside the refrigerator. After the guests arrive at your home, again place the cooker inside the microwave to heat the rice. Within 2 minutes your rice can be steaming hot. After the rice gets cooked and you are done with eating, clean the cooker properly with the help of a gentle soap. Dry the cooker properly and then keep it in a safe place. Therefore, from the instructions mentioned above it must be clear to you that using a microwave rice cooker is not that tough, all you need is to maintain cleanliness and security while closing the lid, keeping the container inside the oven and throughout the cooking procedure. Here, you can find a chart which has clearly mentioned the cooking time and the quantity of water used to cook a particular amount of rice. As mentioned above, every rice cooker comes with a measuring cup whose volume is 8 oz. The quantity of water added to the cooker must depend on the quantity of rice you have to cook. If there is an increase in the quantity of rice, you need to add more water. On the other hand, the difference in cooking time is not much. The time increases slightly with an increase in the quantity of rice. If the rice you need to cook is long grain white rice, then add 2 cups of water and cook it for 10 minutes. For long grain brown rice, 2 cups of water would do. It needs 35 minutes to get cooked completely. Whole grain brown rice requires 2 cups of water and can be prepared in 15 minutes only. 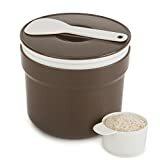 In case of branded brown and white rice, the time required is 35 minutes and the water required is 2 cups. The list mentioned above includes all the general rice used by most of the people throughout the world. For other quality of rice, you can add water as per your convenience. Even the time required to cook depends on the rice. In case you don’t have clear idea then keep checking the cooker within few minutes to check if the rice has been cooked or not. Make sure that the quantity of rice you add to the cooker does not exceed the prescribed limit. There are many cookers which cannot cook more than 3 cups of rice. Use a limited amount of water. Excessive usage of water may drown the rice. Adding one teaspoon of vinegar to your rice makes your rice more fluffy. For white rice only, 1 cup long grain brown rice can be cooked in half cup of water. The rice must be cooked for 30 minutes on 100 percent power. Keep the rice in the refrigerator if it cools down. The rice can again be heated in a microwave by just adding one tablespoon of water to it. 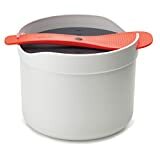 Sistema Microwave Cookware Rice Steamer Set with Lid -- Large Microwave Multicooker (87.9 Oz) and Spoon (BPA Free). Includes a large multipurpose microwave cooker/steamer. You'll also receive a spoon and 19 recipes to get you started. Approximate measurements: Cooker 6-1/2"H x 8-1/2"W x 7-1/2"L. Made by Sistema, a trusted brand in kitchenware. BPA free and 100% food safe. The best thing about microwave rice cookers is they not only can cook rice but can also be used for many other cooking purposes. 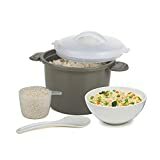 Vegetables, puddings, chicken broth, steaming fish and many more dishes can easily be cooked in a microwave rice cooker. Once you start using the microwave cooker, you can try all the recipes which can be cooked in a traditional cooker. While learning the basics of cooking one must learn the advanced techniques also which makes cooking easier. Rice can very conveniently be cooked in a microwave rice cooker. Even the taste of the rice remains as it is. Microwave oven also consumes very less electricity. Therefore, cooking rice in a microwave rice cooker has lots of benefits. It is also affordable to cook anything in it. So, switch over to microwave rice cooker from your traditional heavy weight cookers. Chili is a simple, healthy, and filling meal you can make in the microwave rice cooker in no time.